As cost paid per user stands well over $3 per user, app marketers and publishers are seeking ways to attract new audiences. The first place to look is right in the beginning ﹘ within the app store itself. In fact, over 65 percent of all downloads on the iOS App Store still come from search. However, competition is fierce in the app economy with over 2 million apps in the iOS App Store and 2.5 million on Google Play. Given these numbers, how do you make your app stand out? With only 100 characters to create a keyword strategy on the iOS App Store, how do you ensure your app is not only getting seen, but is presented in the best light to increase its likelihood of being downloaded? Unless your app is already topping the charts, a well-defined and executed app store optimization (ASO) strategy is crucial to an app’s success in today’s app economy. ●	Discoverability - How easy it is for users to find your app within the app store. This is affected by keywords, app categorization, ranking within categories, and being featured, which provides a significant early boost. ●	Conversion - A critical question to ask is: Once a user lands on your app page in the app store, are they convinced to download your app right away or not? Creative app store assets, such as your app icon and screenshots, along with reviews and ratings, affect user conversions. Those assets require a significant amount of testing before you turn on paid marketing. 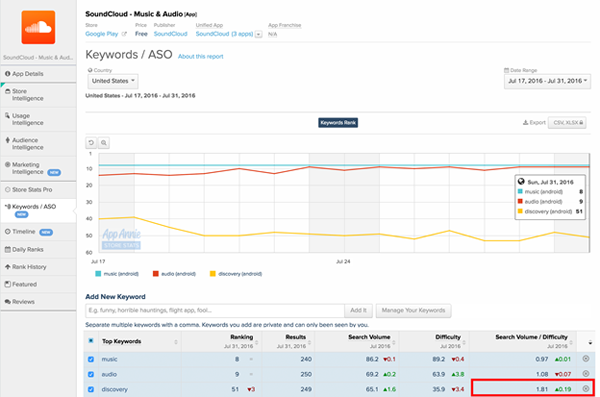 Within your ASO strategy, one of the most important tactics to understand is keyword optimization for your app. It is common, but risky, to go off of intuition for your app’s keywords; however, a smart optimization strategy anchored in data can truly boost your app’s discoverability through organic search. Keyword optimization is both an art and a science. It takes creativity backed with quantitative analysis. 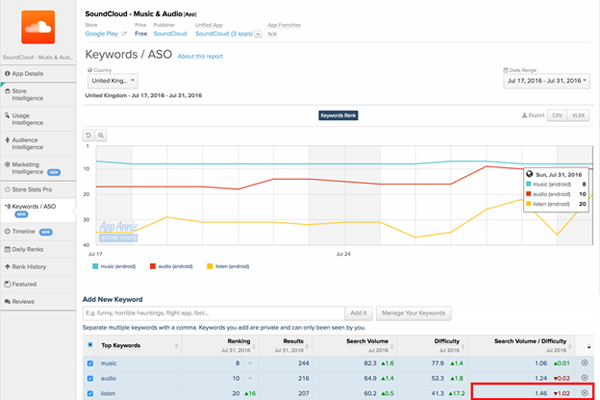 Two key metrics should help guide your keyword strategy: search volume (how often a term is searched for by the app store users) and difficulty (how hard it is for an app to rank in the top 10 for a keyword). The sweet spot for a keyword’s discoverability success is to have high search volume but a low level of difficulty, meaning your app is likely to get a high amount of traffic but with lower effort to rank in the top 10 for that keyword. Taking one example: If we look at the very competitive video streaming and music streaming apps on iPhone and Google Play respectively, we see that keyword changes make a big difference in discoverability success. This is critical for niche apps trying to compete with the likes of Netflix, Hulu or HBO NOW. While words like “Watch TV Shows” on iPhone and “Playlists” and “Free Songs” may accurately describe your app, they drive a relatively low amount of traffic and therefore offer fewer opportunities for install. Conversely, keywords like “TV Shows” and “TV” on iPhone and “Listen” and “Music” on Google Play are searched for more often by users. However, high traffic keywords such as “TV” and “Music” are often highly competitive, making it harder for your app to stand out when using them. Therefore, to rank in the top 10, the optimal spot is finding keywords with both high search volume and low difficulty, such as “TV Shows” and “Listen." Many ASO tools are available to help identify which top keywords are presenting an opportunity. If we take the Soundcloud example below, who is competing with well-established players like Pandora or Spotify, the first assumption would be to depend too heavily on the word “music.” However, using the right tools, we know they can also rely on the keywords “discovery” or “audio” as key terms to help promote their core benefits and offering. Search volume for "discovery" is higher than "music" and less difficult to rank. An app’s keyword rankings, and therefore its discoverability, varies by each country’s app store. Even across similar markets that use the same language like the U.S. and the United Kingdom, search volume and difficulty for each keyword could vary, causing some words to be closer to the sweet spot in one country than in another. For example, “Listen” proves to resonate in the UK for Soundcloud. The keyword "discovery" surprisingly has more search volume than "music" in this case. ASO is crucial to an app’s success. In a crowded app economy where the majority of downloads come from search, it is important to optimize your keyword strategy to generate the largest amount of traffic to your app page and increase opportunities for downloads. It is important to continually monitor, test and evolve your ASO strategy to get the best results. Choosing the correct keywords to secure your app’s discoverability is only half the battle to achieving an optimal ASO strategy. Once a user is on your app page, you still need to convince them to download your app. Building and testing assets like icons, screenshots, descriptions and ratings and reviews are crucial to communicating your app’s value proposition and driving downloads. Search offers a unique opportunity to acquire users at minimal cost and should be prioritized within a larger user acquisition strategy. Fabien-Pierre Nicolas is the vice president of MarCom at App Annie, a single easy-to-use platform for running every stage of your app business.